Otto Eduard Leopold, Prince of Bismarck, Duke of Lauenburg, simply known as Otto von Bismarck, was a Prussian-German statesman whose actions unified Germany, made it a major player in world affairs, and created a balance of power that kept Europe at peace after 1871. As Minister President of Prussia from 1862�1890, he oversaw the unification of Germany. In 1867 he became Chancellor of the North German Confederation. Bismarck designed the German Empire in 1871, becoming its first Chancellor and dominating its affairs until he was removed by Kaiser (Emperor) Wilhelm II in 1890. His diplomacy of Realpolitik and powerful rule gained him the nickname the "Iron Chancellor." As Henry Kissinger has noted, "The man of 'blood and iron' wrote prose of extraordinary directness and lucidity, comparable in distinctiveness to Churchill's use of the English language." As the leader of what historians call "revolutionary conservatism" Bismarck became a hero to German nationalists; they built hundreds of monuments glorifying the symbol of powerful personal leadership. Historians praised him as a statesman of moderation and balance who was primarily responsible for the unification of the German states into a nation-state. He used balance-of-power diplomacy to keep Europe peaceful in the 1870s and 1880s. He created a new nation with a progressive social policy, a result that went beyond his initial goals as a practitioner of power politics in Prussia. Bismarck, a devout Lutheran who was loyal to his king (who in turn gave Bismarck his full support), promoted government through a strong, well-trained bureaucracy with most decisions in the hands of a Junker elite representing the rural aristocracy in the east. 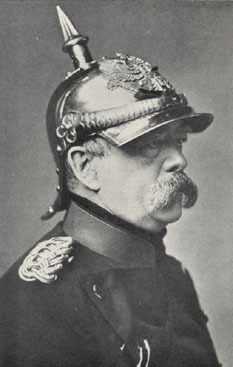 Bismarck had recognized early in his political career that the opportunities for national unification would exist and he worked successfully to provide a Prussian structure to the nation as a whole. While the new nation had universal male suffrage, the elected officials did not have full control of the government.